Mommy & Me Holiday Party Tradition Mama Say What?! | Mama Say What?! My daughter was only seven months during her first Christmas season, but I really wanted to start a tradition from the get-go. I wanted it to be small and simple. I only invited her young girl cousins and one friend after deciding to make it a “Mommy & Me” event. No boys allowed! This not only cut the costs, but the stress of having a full house too. Her first year, she only had five guests in total. 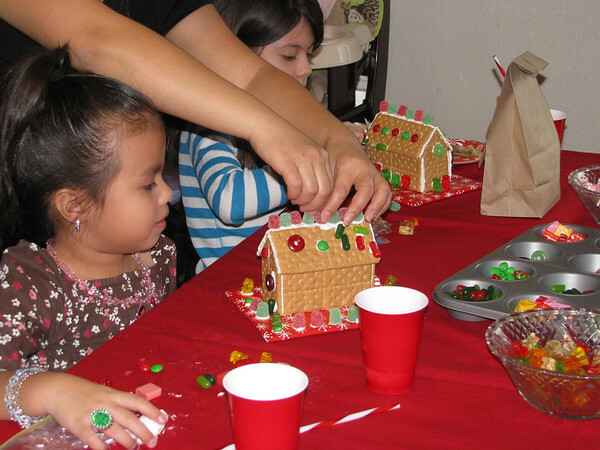 I pre-assembled the houses myself the night before so that the girls could focus on decorating. 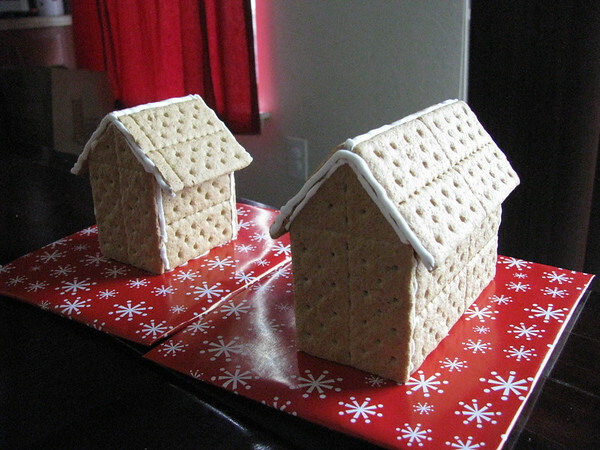 After Googling countless gingerbread recipes and house layouts, I decided that using graham crackers would not only be easier but tastier just in case the girls did decide to eat them. It took a few tries, but I finally got the hang of it. 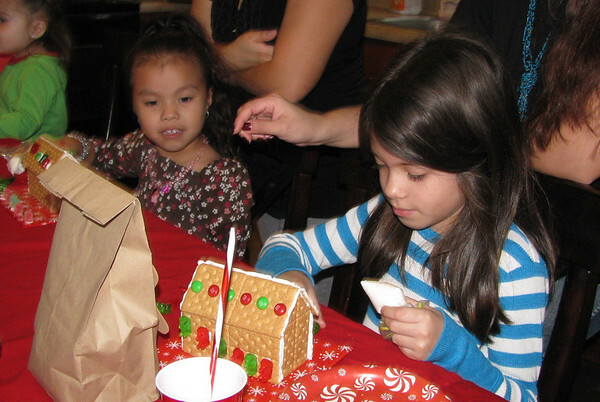 Each girl had her own piping bag (a baggie) filled with royal icing. I bought candies from Target and Sam’s Club. In all honesty, I bought WAY too much candy for the tiny houses, but it was my first rodeo, so live and learn. This whole party was her first ever, so I made a lot of rookie mistakes, and I’m sure I’ll continue to make a few more. I’m hoping by the time she’s five, we’ll have five fun parties under our belt and be pros at it. The girls had fun creating their masterpieces. 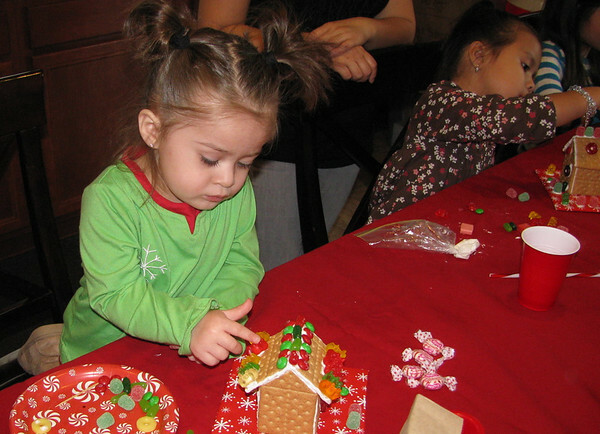 Afterward, we enjoyed hot chocolate and cookies while watching Prep & Landing and playing. This tradition is important to me because I think it’s important for her to spend good quality girl time with her cousins and also her friends (as she gets older and starts to make them). I also want her to look forward to it every year, both planning it and enjoying it. 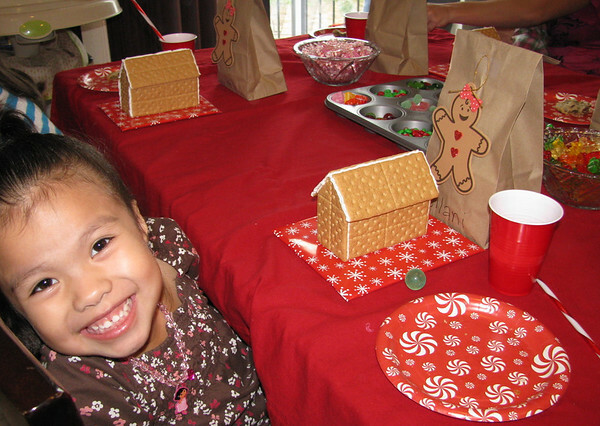 When she thinks of Christmas, I would much rather her look forward to getting together with her friends and having fun, than just how many presents she’s going to get. 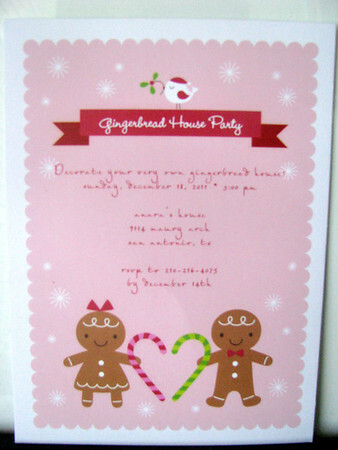 I also just love the idea of having a party where no presents are involved. That way, no one feels obligated or stressed about coming. They know that they’re just coming to have a good time. Added by Guest Mama on November 29, 2012. This is such an awesome idea, I totally love it! It’ll get you guys some great memories A can look back on when she’s older. Wonderful idea! And it will be fun to keep it going every year as your little one gets older!